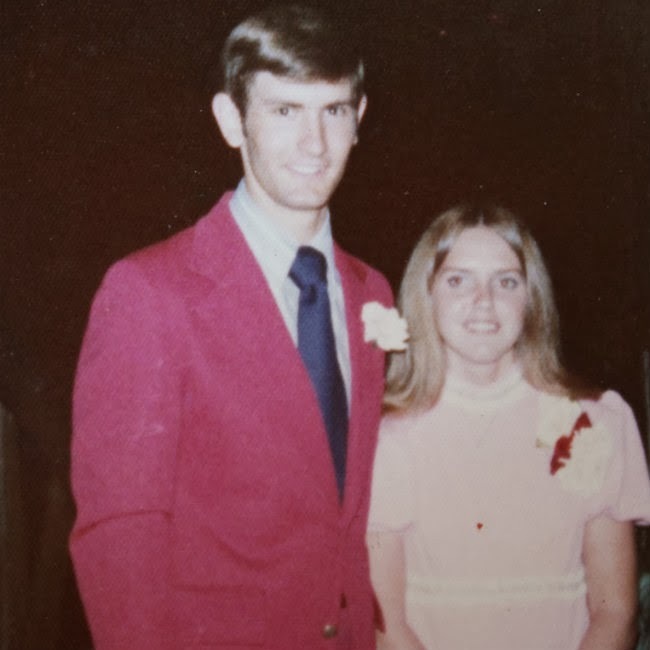 Today I'm beyond excited to have my parents on my blog. My Dad wrote these answers so perhaps someday I'll have my Mom share her perspective. I think my favorite and most funny answer my Dad gave was about raising kids in Brazil. Before you read all about them I'm here to tell you that they are two of my biggest heroes. 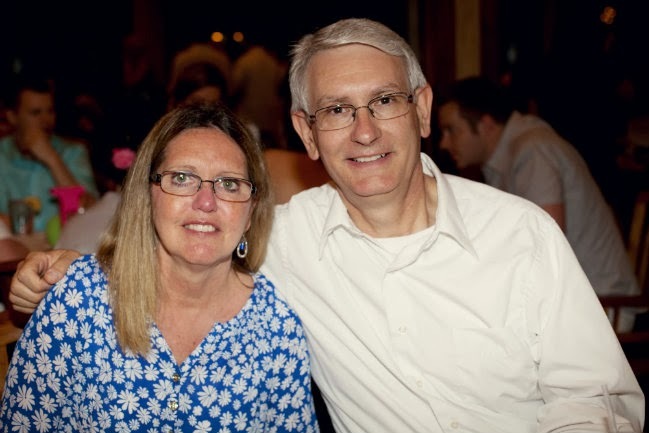 They served faithfully in Brazil, came back to the States and rebuilt their life from scratch. They currently serve faithfully at church while at the same time investing in us kids as well as lots of other people they have taken under their wing. I'm pretty sure their reward in heaven will be great and I'm so thankful God gave me them as parents. Twelve years, 2 years on deputation (traveling in the US raising support from various churches) 5 years in Sao Paulo, 1 year on furlough visiting supporting churches in the US, 4 years in Umuarama, Brazil. 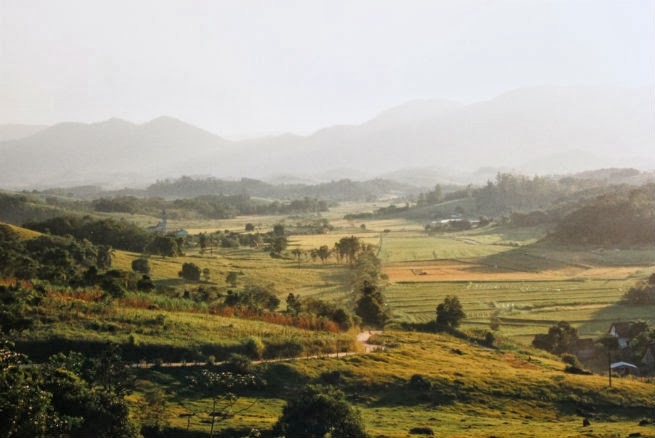 How did God call and lead you to the country were in? There were several factors that led to us going to Brazil. One in both of our lives was attending churches, as children and then later in college, that had a strong emphasis on missions. We were constantly presented with the need, got to meet and hear various missionaries, and had pastors who had a heart to obey the great commission. The Lord used that time to impress me with the need there. However, I was open to considering other places. It was during a mission’s conference that I felt that the Lord would have me to serve as a missionary. After graduating from college and serving in a church in Colorado for two years I did feel that Brazil was the place where we should go. What specific ministry were you involved in? We were involved in church planting. I also, taught in a “seminary” which is equivalent to a Bible college here. Did you serve with other missionaries? Our first term we helped other missionaries in their works in Sao Paulo. It was very limited the first two or three years as we were learning the language. Our last year in Sao Paulo we were in charge of a church plant while the missionary who started it was in the US on furlough. Our second term, in the city of Umuarama, we were working as the only missionaries in the church. What did you most enjoy about your work? Seeing the Lord work in the lives of people. Even though we spoke with an accent and even said things in a way they never would it was amazing to see God’s Word work in their hearts and how they responded to His Word. I think that varied from day to day. First term there was language school every day for the first couple of years. We would either ride the bus or drive to language school. Sao Paulo was a city of over 22 million people. So the commute was at least an hour and a half each way. Three hours of class every day. Then homework to do. Of course, the kids were small and we had to take care of them. There were the church services, visitation, kid’s activities at PACA (Pan American Christian Academy) etc. We also taught in the seminary at Pastor Nilton’s church in Sao Paulo. Second term, we were in charge of the work in Umuarama. Again, church services, visits, home school, services at houses in the town (culto em casa), a mission work in the village where Antonio lived (our 95 year old member). During our time there we build and educational building which was a big undertaking. Many days were spent running after supplies, helping mix concrete, dealing with government regulations etc. I would preach three to four times a week. We had Sunday school. Nancy would help in that, play piano and work with ladies ministries. Tell us about raising children in a different culture. Advantages? Disadvantages? It was a REAL breeze and I am now heartbroken to learn that their mom’s spankings hurt worse than mine! 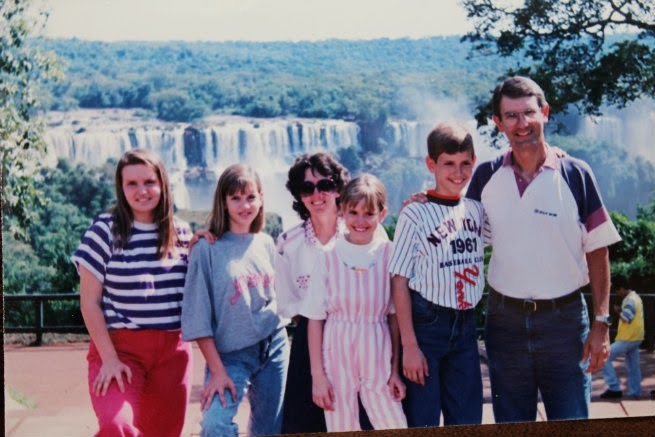 Awkward family photo taken at the Iguacu Waterfalls in Brazil. If you know of an award for 'awkward family photos' let me know - we would so win. Tell us something about the people? They are the most gracious people you will ever meet when you go to their home. It doesn’t matter if they are extremely poor or well off financially. Yet, the same folks that are so gracious in receiving you in their home will run you off the road in traffic. Gracious in the home, ruthless on the highway!! What was your favorite food to eat from the country you were in? Probably, their “rodizio” restaurants. You get about 20 kinds of meat served that have been cooked over charcoal, plus all kinds of salads etc. They just keep coming by your table and slicing off all the meat you can eat! Can you tell us something interesting about the culture? One thing that is interesting is the way you visit people. They are very warm when it comes to people visiting them in their home. It didn’t matter if they were very poor or wealthy they would always prepare fresh coffee and serve something to eat. It might be only saltine crackers in the home of the poor but it was a must. The visits were lengthy. You couldn’t simply invite them to church or talk with them about the Lord immediately. You would have to talk about things in general for at least half an hour and then move on to why you really came. When it came time to leave you couldn’t just say you needed to leave. There was a cultural process that you had to go through. About 30 min. before you would leave you had to say, “I need to be going.” and they would say, “It’s early”. This HAD to occur at least three times before you could leave without being offensive to them. What is the main religion there? Catholicism is #1. There is a strong sort of weird type of charismatic movement which is very strong on emotion and weak on doctrine. Also, there is a strong presence of spiritism. How did people respond to the gospel? Like all places it depended on the person. You hear stories about many conversions coming out of Brazil. However, the gospel of repentance and faith is not as readily accepted. As Jesus said, the gate is narrow. I do feel that when we were there people were more open to the gospel, as a general rule, than here in the US. Did people’s prayer for you and the ministry have a significant impact? We saw the Lord do a lasting work in people’s hearts. I think that it was often in spite of us and not because of us. Had it not been for those who prayed for us I don’t believe that we would have seen the church come to a place where they were ready to call a national pastor and continue on as an independent work. How did people encourage you? By just really caring. I think that is true of people there and Brazil as well as people here in the US. One example that comes to mind ties into the previous question. When we were home on furlough I spoke at a church that supported us in Texas. I got there early and there was an elderly man at the church. When I walked in he said, “You are Max Brown and I pray for you every day.” I told him thank you and then he went on to call Nancy’s name and each one of our four children by name. I knew that he really did pray for us daily. What an encouragement. What did you most miss from home? Personally, the west. I grew up in New Mexico. I missed the mountains, the desert, the spectacular sunsets, and the delicious green chile. What did you like to receive from home? Letters were always appreciated. The internet wasn’t quite up and running. Also, phone calls were greatly appreciated even though, at that time, they were very expensive. What ministry are you involved in now in America? I serve as a deacon in our church, I also teach an adult Sunday School Class. One night a week I drive a van to pick up a load of under privileged kids and take them to AWANA at our church. Nancy works in the church nursery and also visits the kids that attend AWANA. Thanks so much for taking the time to read this. I hope you not only enjoyed it but that it sparked your love for missions and for sharing Jesus. I love this! I definitely want to hear your mom's perspective at some point. I too am grateful they are your parents because of the huge influence they've had on your life. PS- I love your awkward family photo! I think it's cute! OMG I bet your parents know Peter's family! Peter grew up at PACA, and Peter's dad worked in church plants and taught at a seminary in Sao Paulo (he is now the director of the seminary). Ask your parents if they know Joe and Meta Arthur! Did you go to PACA??? My Dad said he doesn't know them but he did ask what group / mission they worked with? I was to little to go to PACA but my sister and I think my other siblings went too. It really is a crazy small world!